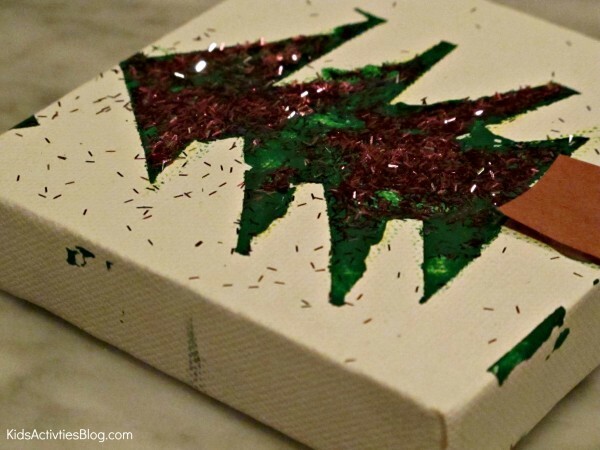 This easy Christmas craft for kids is easy Christmas art which may even double as Christmas decorations for future years. We here at Kids Activities Blog love finding easy art projects that become family activities and when the result becomes a treasure, that is a bonus! This Christmas Resist Painting project is super cute. I am a huge fan of resist painting for younger children. For me, well, my boys are a little extreme, and, well, when we paint, well, paint ends up all over their bodies. They are tactile learners, what can I say? 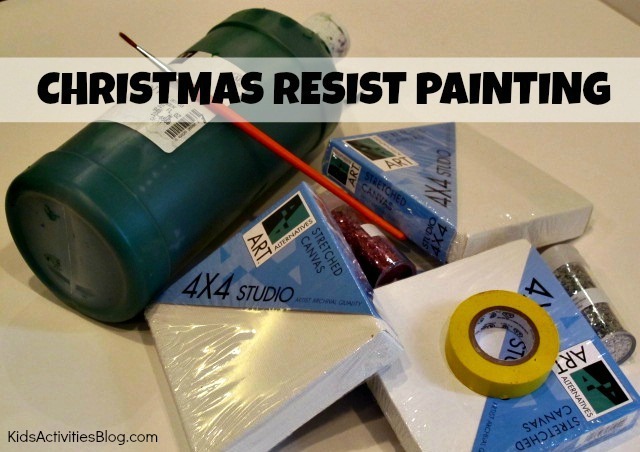 The great thing about resist painting is that it is easy and inexpensive. I took the painter’s tape and made our Christmas Tree and Star designs. In the past we have created a resist painting letter with the tape so the painting is opposite of what we did with this project. We even created a cute toddler Valentine resist painting heart for Grandparents. Then we added some glitter and let it dry. Peeling the tape off the canvas is always a joy for the kids! These painting projects work well with younger children because they can get messy and super creative. Seeing the design come alive after the tape is removed is fun and exciting for everyone involved in the process. Christmas crafts and recipes galore!